These swords are given of honor in the military fields. We sell to all the military with these swords of honor. We are especially proud to bring you fully approved dress and drill sabers and swords made by the current government contractors. We know our fighting men ask for and deserve the very best. We would be equally proud to deliver to you any of the standard military dress sabers and swords used in the Armed Forces today. Each fine saber and sword is manufactured according to exacting government specifications by only a chosen few. All blades are high polished stainless steel, detailed and appropriately etched according to government specifications. We guarantee that your military personnel, drill teams, students and graduates will be completely satisfied with these sabers and swords. All are available in 28", 30", 32" and 34" lengths and include the government specified scabbards. FAQ - How do I determine the right length of the sword? Cup your hand, place your arm at your side, straight down. Measure from your palm to the the tip of your ear. This should give you the proper sword length. This Air Force Leather Sword Guard can be used with the Army NCO Sword, West Point sword, Air Force sword, Air Force Academy sword, or Army Academy/Honor Guard sword. Top grain, military issue Black Dress Frog matches issue dress belt and securely holds military swords at a comfortable reach. Fits all military dress belts. Also available in White. See item 200462. Our Model 1850 Staff and Field Officers Sword 500124 is a fine reproduction saber is a faithful copy of ones used. The hand forged blade is British military spec steel that will flex over 20° and return to true. The leather handle is wire wrapped. Befitting their rank, this sword displays a high degree of ornamentation. This Navy Officer Ceremonial Sword Belt is made of black leather with a gold-plated buckle. For use with the Navy Officer Sword. Belt width is 1-3/4 inches. Measure over your uniform. Choose your waist size, 30-34 inches, 36-38 inches, 40-44 inches or 46-48 inches. This Model 1850 Foot Officer's Sword was supplied to all Army foot officers with the rank Major and below from 1851 to 1865. The tempered high carbon steel blade is etched with the letters "US", a floral pattern, branches and scrolls. The solid brass guard and hilt also displays a floral design. This synthetic sword guard is made to military specifications and is suitable for Marine or Army sabers. Our US Navy Officers Saber are proud to bring you government spec dress and drill sabers and swords. We knows our fighting men ask for and deserve the very best, that’s why we have been chosen by the government to produce the NCO saber for the U.S. Marine Corps. The US Marine Corps Officers Saber Sword comes with authentic natural bone grip (no two will be alike). Please specify blade length 28", 30", 32" or 34". Includes the government specified scabbard. 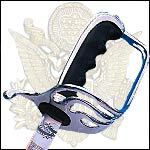 US Army Officer's Sword, polished stainless steel blade, detailed and etched according to government specs. Includes the government specified scabbard. This US Army NCO Sword is the regulation spec U.S. Army NCO sword. Features a tempered stainless steel blade, hand worked to a mirror finish. Fittings (pommel and guard) are intricately cast in solid brass and richly plated in 24K gold. Grip is wrapped with silver plated brass wire. This US Army Enlisted Personnel Belt is a government spec, current issue ceremonial belt. Features 24K gold-plated buckle with Army Coat of Arms and matching belt keepers. One size. Belt width is 1-3/4 inches wide. Adjustable up to 48 inches in length. This US Army Officer's Ceremonial Belt is a government spec, current issue ceremonial belt. Features 24K gold-plated buckle with Army Coat of Arms and matching belt keepers. One size. Belt width is 1-3/4 inches wide. Adjustable up to 48 inches in length. The US Marine Corps NCO Saber Swiord comes with authentic natural bone grip (no two will be alike). Please specify blade length 28", 30", 32" or 34". Includes the government specified scabbard. We are especially proud to bring you the US Coast Guard Officer's Saber government spec dress and drill sabers and swords. Since we know our fighting men ask for and deserve the very best, that’s why we have been chosen by the government to produce the NCO saber for the U.S. Marine Corps. This West Point Cadet Officers Sword is a government spec dress and drill sabers and swords. We knows our fighting men ask for and deserve the very best, that’s why we have been chosen by the government to produce the NCO saber for the U.S. Marine Corps. Our White Leather Gloves are military regulation, genuine leather, dress gloves. Perfect for color guards, dress uniforms and more. Unlined.